00:15 300th Podcast Next Week At The Crows Nest Come Join Us And be Part Of The Fun 11:30AM Saturday Come be Part of The Studio Audience! 44:32 Women To Women Donation Drive Info Here www.facebook.com/PaulinesGifts Do women today realize the high waisted jeans they are wearing are “Mom Jeans”? 01:09:26 How Old Would You Let Your Responsible Teenage Daughter Go To Topsfield Fair With her Friends and Curfew? ABSOLUTELY CRUSHED IT. POLL: WHO YA GOT- WHITNEY HOUSTON OR @MALEAEMMA? Look inside! Major Fred W Ritvo Veterans Center Gloucester Mass. Have you visited the Major Fred W. Ritvo Veterans Center headquarters for Cape Ann Veterans Services? Full house and major tribute. If you missed the ceremony, Cape Ann TV – 1623 studios- was filming. Gloucester and Cape Ann’s generous community join together to pull off this awesome, model initiative. Numerous volunteers prepare for and host on site. The welcome home bundles are loaded up with community business gift certificates and support. Gloucester Elks Lodge #892 was recognized for the community work they do for Cape Ann’s returning veterans, receiving the Edward Spry trophy for being the #1 Lodge in the Commonwealth for veterans activities. Jayne Morse won the Elk’s Volunteer of the Year Award. The Cape Ann Veterans Service office gives guidance and helps with information for the returning veterans. ‘Welcome Home to Cape Ann- We Left the Light on For You’ outreach for Returning Veterans is such an inspiring national model. It couldn’t happen without leadership, support and volunteers. Lots of good eggs here! Photos of candlepin bowling league from Pauline- on Thursday nights it’s Cape Ann Veterans at Cape Ann Lanes, Gloucester, MA. Contact Adam Curcuru, Director Cape Ann Veterans Services about the fun league. Contact Cape Ann Lanes about the other nights: it’s a happening spot! Thanks for sharing photos, Pauline and Adam! Sweet voices lifting on the wind. Video from Adam Curcuru, Director Cape Ann Veterans Services, 2017 installation Stacy Boulevard Flags, Gloucester, MA. This is info on the “Welcome Home Initiative for Returning Veterans” coming back to Cape Ann. If you have previously given something or may be interested in making a donation with either a Gift Card from your business or even a small monetary donation this letter explains what to do. This year we have 10 returning Veterans to Cape Ann, (9 men and 1 woman). I am proud to have named and designed the Logo for the Initiative but am even more honored to be involved with the Elks and the Gloucester Veterans office with this event. Welcome Home to these American Heroes! Charles and George received some fun photos and stories about the Gloucester High School cadets program. Here’s a challenge. Local prize for first correct responses. 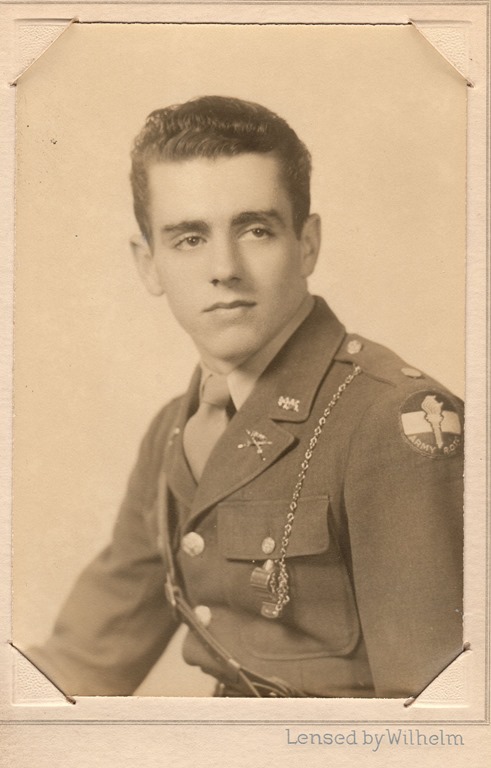 Who is this cadet with Brando brows and cleaned up coif? Does anyone have any information about the GHS graduation photographer and year? 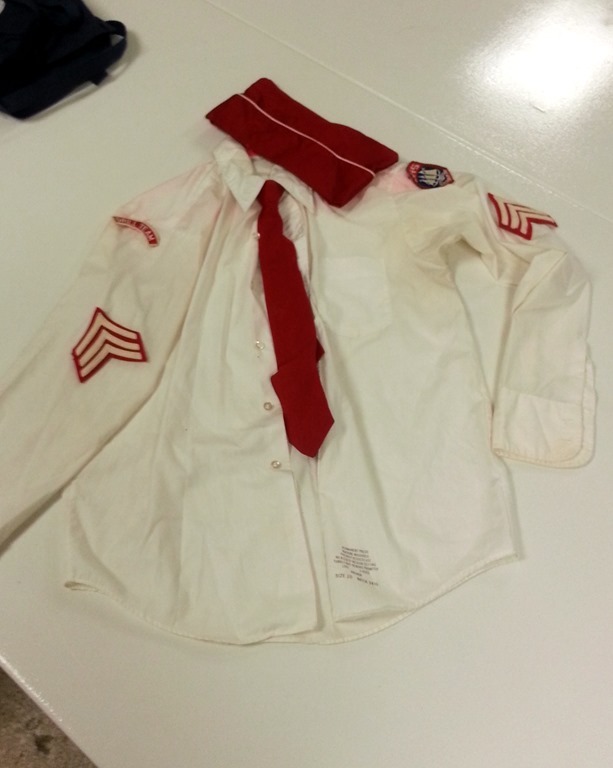 When was the uniform in the color photo worn at Gloucester High School? 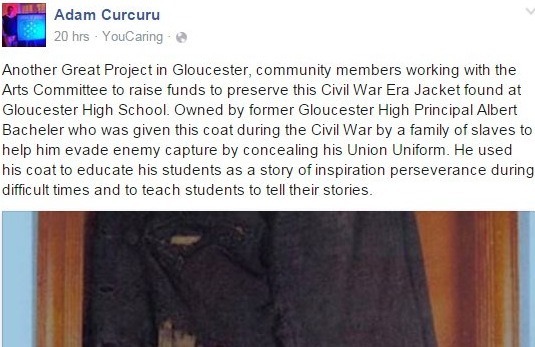 Good Morning Gloucester and the Gloucester Daily Times spread the word about the Gloucester High School Civil War coat that needs restoration. Charles and George set up a youcaring site for anyone who wants to donate on line. Due to their age (6th grade) they themselves don’t have Facebook, but others have been sharing for them! They want to get back to it in January, “because no one wants to do raise money in December.” Money collected will go directly to the Gloucester fund and then on to a textile conservator through the Committee for the Arts.